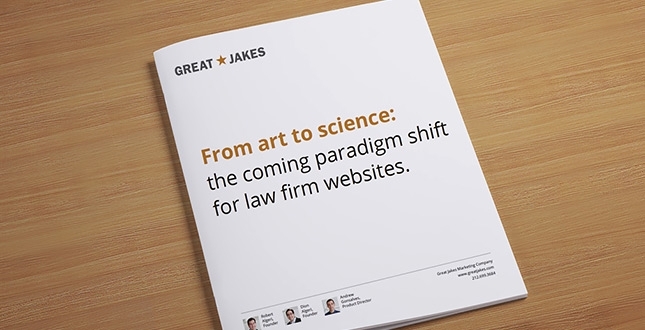 At Great Jakes, we believe that law firm websites are about to undergo a gigantic shift. Furthermore, we believe that the emerging paradigm has the potential to transform the entire industry of legal marketing. We were so excited by this emerging trend, that we decided to write a 15-page whitepaper about it and share it with you. 1. It generates and nurtures new business leads. As lead nurturing websites catch on, law firms will inevitably begin to think of their websites very differently. Websites will no longer be considered pretty “branding” materials, in the same category as printed brochures. Rather, websites will be considered proactive business development tools whose performance can be measured and optimized. And this has the potential to revolutionize the field of legal marketing by shifting it from being an art to a science. Please fill out the form below to view the PDF of our whitepaper. Want to learn more? Time for a demo? We’re happy to speak. 8 comments... read them below or add one. I hope you are doing well. I enjoy following your work. Good white paper. I’d say we’re about 2 years from being ready to overhaul our site for this but this is absolutely where we need to go! Thanks for an interesting read. What’s your thinking about the regulations in the UK re: mandatory informing of website visitors about cookies? My web gurus tell me this may become an issue in the U.S. in the future. Wonder if “WE FEED YOU COOKIES” is going to have to be the headline on every site? So, will US based law firms eventually include messages about cookies usages? There’s nothing mandating it now, (that we are aware of) but I wouldn’t be surprised if bar associations began requiring it. Thanks for sending this along and I couldn’t agree more. The rest of the marketing world is leading the charge with data to be more laser-focused to drive revenue and law firms should be doing the same. Thanks for the whitepaper, Robert. As a firm, we will not do anything that tracks people by name, in the manner you are suggesting. We feel that is too invasive. Thanks for your feedback. We’ve heard this before and I think it admirable that law firms are concerned with maintaining the privacy of their clients and prospective clients. Every business that uses lead nurturing technologies needs to walk the line between being invasive and being helpful. When used correctly, this technology is able to offer just the right information, at just the right time, to the exact right person. The result is a better user experience for future and current clients. It also offers firms real ROI on the time and resources that they dedicate to marketing. But there’s something else to consider — the public’s expectation of privacy, and their willingness to be tracked online, are rapidly changing. People are beginning to understand that their actions online are constantly being tracked, and they don’t mind. In Europe, websites are required to let visitors easily opt out of tracking cookies, and studies show that a minuscule percentage of people choose this option. This leads us to believe that, when it comes to tracking cookies, the reluctance that some firms may currently have will probably recede over the next several years. Robert, Dion, Andrew – thank you for the insightful whitepaper. I found myself thinking “Yes! We need to do this!” I want desperately to more clearly “connect the dots” between our marketing efforts and business development. Identifying emerging issues, and being responsive to those needs in a target way makes all the sense in the world. I’m totally on board.